USF graduate degree recipient Adriana Florez is the creator of Yummi Foods, which makes healthy cookies, muffins and empanadas. When Adriana Florez’s family came to the U.S. from Colombia a little over a decade ago, each family member was only allowed to bring two bags. The night before they set off, she caught her mother packing an empanada maker. 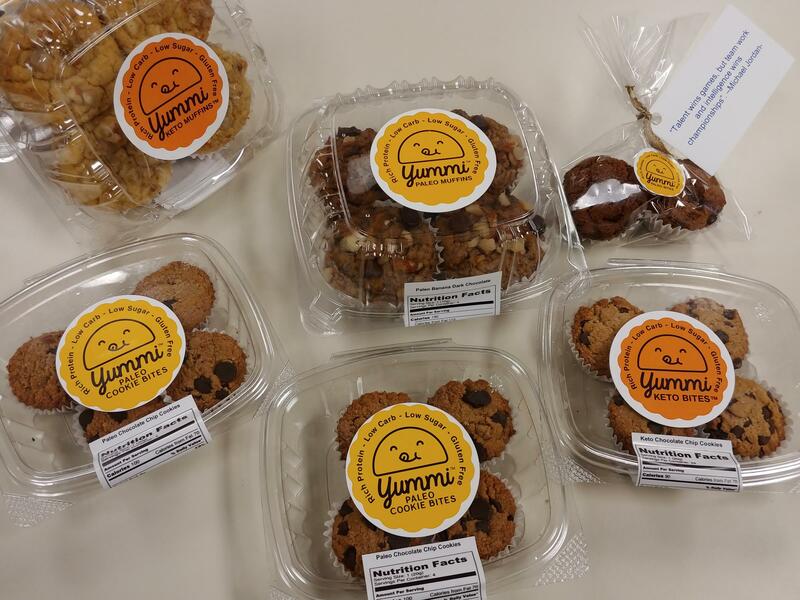 University Beat continues profiling entrepreneurs with ties to the University of South Florida with a look at Yummi Foods and its creator, graduate degree recipient Adriana Florez. About a year after moving, Florez’s mom, using cooking skills handed down from her own mother – and that appliance – started a business making and selling the meat, potato, cheese and spice-filled pastries. While the business eventually failed, the venture started Florez on the path she continues to walk now as the founder of Yummi Foods. Her mom also provided another important milestone on Florez’s journey. About five or six years after the empanada business failed, she became sick: diabetes, high blood pressure and eventually kidney failure that led to a transplant. By this time, Florez had added skills picked up working with her mom in the kitchen to the Bachelor’s degree in Engineering she had received in Colombia. “I noticed that the food in the hospital was definitely not very good for people to recover, so I started doing food at home (for my mom) – less oil, increasing the amount of protein, less carbs, just trying to balance it out,” she said. Florez believes that change in diet helped her mom start recovering. She took the lessons she learned from that experience and formed her own company – Yummi Foods – making healthy empanadas: low calorie, gluten-free and oven-baked instead of fried. And then, her mom’s sweet tooth for cake and cookies gave Florez her next inspiration. Yummi Foods paleo- and keto-friendly cookies and muffins use natural ingredients. Not just any cookies and muffins, but keto or paleo- friendly pastries, made using natural ingredients like almond and coconut flours, coconut sugar and oil, sugar-free chocolate chips. Flavors include chocolate chip, dark chocolate, double dark chocolate, vanilla, vanilla nut, zucchini and lime. There’s also one not-so-secret ingredient, passed down from her mom, who still works with Florez in Yummi’s professional kitchen, making 2,000 cookies and 1,500 muffins every month – love. While that love is added for free, the healthy ingredients mean Yummi’s pastries cost more than other products on the market – $8.99 for a four pack of muffins, $5.99 to $6.99 for a package of cookies. But Florez said those ingredients also fill people up quicker. Florez received a graduate degree in entrepreneurship from the University of South Florida, where Yummi Foods became part of the Student Innovation Incubator, a USF-backed launching point for small companies like hers. “They give you resources, they give you more training, they’re not going to take your hand and just walk you (through), no. You have to put the work in. The harder that you work, the harder they work to help you,” she said. 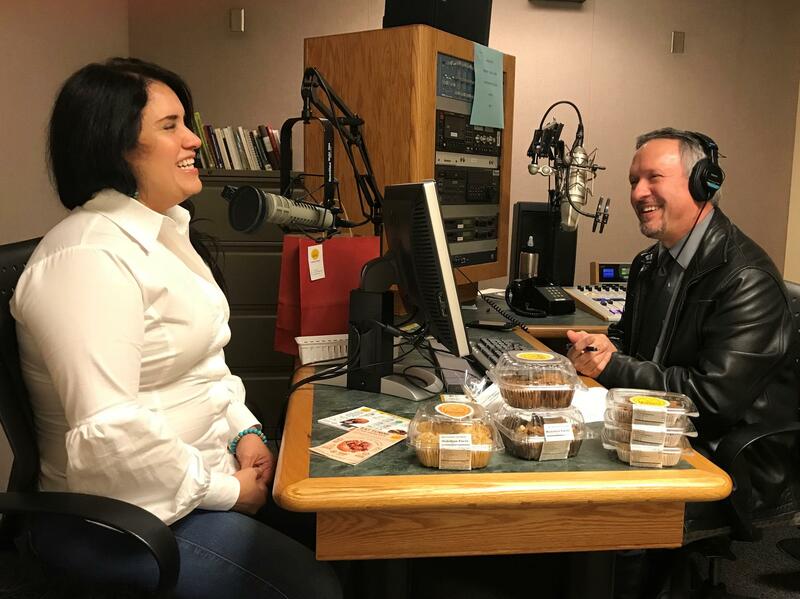 Adriana Florez talks to WUSF's Mark Schreiner about Yummi Foods. “I really want to make sure that we’re doing the right thing with these products because it’s not only about a trend, a healthy trend or healthy diet, not at all,” she said. “I feel that right now, the world is changing and everybody’s changing mentality, the awareness about being healthy is increasing. Yummi Foods currently has distribution online and in a number of small, health-oriented Tampa Bay restaurants and supermarkets like Inside the Box Heights Public Market, Intelligent Gourmet and Abby’s Health and Nutrition. This year, Florez hopes to expand that network to about 190 supermarket locations. She’s also planning to start selling dry mixes of her healthy cookies and muffins this spring as well. Just remember to add your own love.